That’s the same inbox calculus your potential readers go through, too. In fact, recipients deleted nearly 10 percent of the emails that brands sent to them last year without even reading them. What’s more, more than half of successful email marketers surveyed claimed that creating relevant content was the biggest factor in reaching their goals. Unless you’re feeling awfully lucky, you must optimize your business email content by tailoring it to suit your readers and their needs. Don’t waste resources on email content that isn’t working—after all, you are directly and deliberately reaching out to your own consumers and pre-qualified sales leads. A targeted email is much more powerful than a print or digital ad that could be viewed by millions of non-vetted, unqualified strangers. 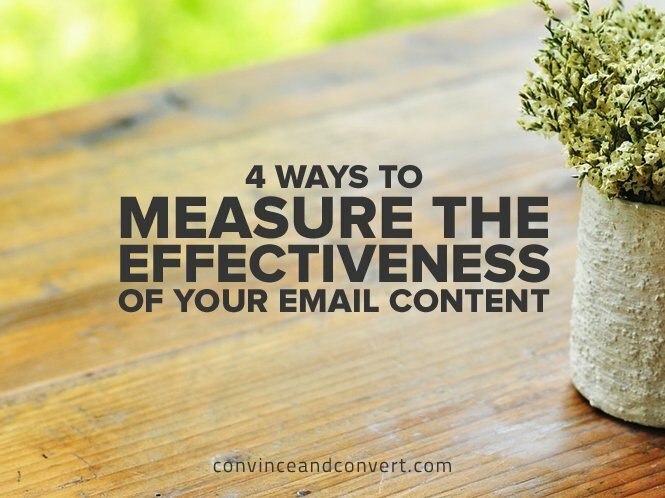 To see a return on your email marketing investment, you’ll have to get serious about measuring the effectiveness of your email content—what works and what doesn’t. If you don’t commit to these analytics, you won’t know what your market wants. You’ll just blindly send emails, hoping for opens. Being good is better than being lucky any day, and you get good at email marketing by embarking on strategic study of your email content and campaigns. Here are four ways to figure out where to focus your efforts to see the greatest success. As the first piece of content readers see, subject lines are your first hurdle—or gate, depending on your audience’s response. As such, your subject lines dictate your open rate. Take a good look at your open rates now to get a feel for which subject lines have worked well (or not) in the past. Craft at least two different subject lines for your emails—A and B—because you’re going to split test them (a.k.a. A/B testing your campaign). Use words aligned with your brand. Remember: People like to see their own names and even shout-outs to their cities. Use 50 characters or less—that’s all most mobile device displays can fit. Just as you don’t duplicate content online for SEO reasons, don’t reuse subject lines, either. In every future campaign, run A/B tests on subject lines, so you can hone in on what makes your audience tick—or rather, click. Your main goal in email marketing is getting more visitors to your site, where your other content and calls to action can get to work nurturing visitors along their sales journey. To find out how well your emails accomplish that, you need to track click-through rates (CTR) for your links. An increase in CTR means more readers are finding your content applicable and actionable (and clickable). Link to the same piece of site content more than once in a single email. This is how you A/B test—or A/B/C/D test—anchor-text language to discern which will compel readers to click. Figure out how long people are spending with your emails. Are they actually reading them? If they’re just opening—or being served a preview by their inbox applications—but then immediately deleting them, then the engagement rate will be less than two seconds. It takes at least six seconds to develop an impression of just one part of your email content. Anything between three and seven seconds should be considered a “skim rate” metric; a “read rate” means emails are open eight seconds or more. Remember: As with any good experiment, don’t test all the variables at once. Otherwise, when you tweak your email marketing content, you won’t know which changes worked best. None of these can be considered true optimizations until they’re repeatable. Several different email service providers (e.g., Bronto, Constant Contact, Infusionsoft, MailChimp, Campaign Monitor, and AWeber) include these core metrics. Generally speaking, all of them offer a free basic service for small marketing programs that have short subscriber lists of around 250 email addresses. As your campaigns improve, you’ll grow out of the free versions, but you should first have the additional sales to cover the extra overhead. When you know the effectiveness of your email content, down to the level of engagement for each individual reader, you can add much more value to your messaging—even to the point of interactive personalization. Delivering that kind of juice to opted-in inboxes will send that many more engaged visitors to your site (and more informed, mature leads to the sales team). And last, but far from least, you will be able to show the C-suite a higher ROI for its marketing spend.